A bright colour scheme of magenta and electric blue? Check. A nod to looming Brexit? Check. A reassuring "Hang in there" strapline? Check… again. Hang on, Revolut. This seems awfully familiar. 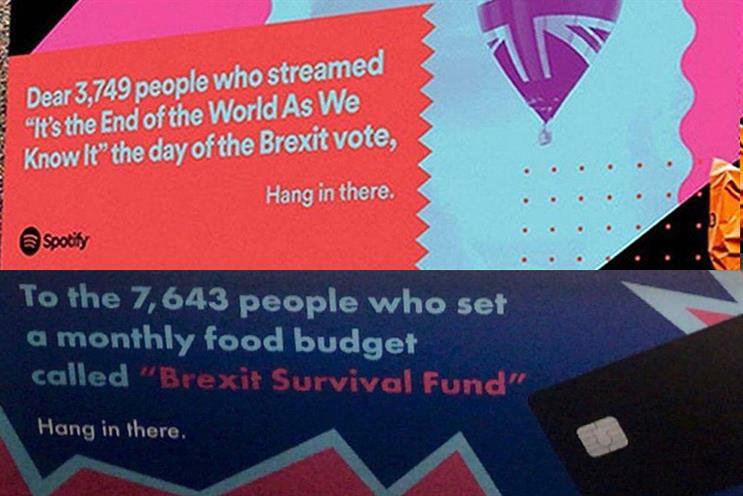 The out-of-home copycat execution reads: "To the 7,643 people who set a monthly food budget called 'Brexit Survival Fund'… Hang in there." This is strikingly similar to Spotify’s most recent "Wrapped" campaign: "Dear 3,749 people who streamed 'It's the End of the World As We Know It' the day before the Brexit vote, Hang in there." From the aesthetic down to the idea of drawing on user data to inspire the copy, the banking app’s campaign is a clear rip-off of Spotify's year-end campaign.